The Feltmakers’ Livery Lunch was held on 12th July 2017 at the Cavalry and Guards Club, 127 Piccadilly, a favoured venue for the Feltmakers with a history going back many years. The Cavalry Club was founded in 1890 and amalgamated with the Guards Club, which was based in Charles Street, in 1975. Our esteemed Clerk, Jollyon Coombs, has been a member for over 50 years. He doesn’t look old enough! As we entered the Club a 42 gun salute was in progress, not for us unfortunately but for the King and Queen of Spain, who were on a State Visit. 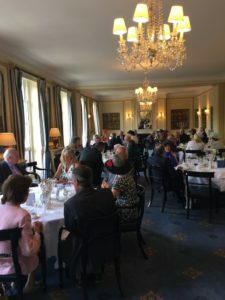 We were welcomed to a champagne reception by our Master, Jeremy Brassington, and his charming wife Pearl, and five Past Masters and, after a mutual admiration of the ladies’ outfits and of course hats, we were ushered into lunch. Grace was given by our Honorary Chaplain, The Rev. Andrew Pritchard-Keens, whose father-in-Law, Peter Keens, is also a Past Master of the Feltmakers. The food was delicious and very appropriate for a summer’s day. We began with chicken liver parfait, followed by salmon mayonnaise and Eton mess for dessert and, of course, wines to compliment. Coffee was served and our Master rose to give us a most interesting resume on his Charity for his year in office called Hearing Link, which is such a beneficial organisation to so many people with hearing problems, both profound and perhaps those of us noticing hearing loss in its early stages. He gave us an update on the money raised from his golf day and over the course of his ‘reign’ which came to well over £20K, a wonderful result. Lunch over and a little more chat we all went our separate ways having enjoyed a most convivial time, hoping that the King and Queen of Spain had arrived at their destination and the London traffic had returned to normality!